We’re excited to share our latest posters for The National, for their recent pair of shows at the Hollywood Palladium in Los Angeles. Our work for The National over the years has focused on aerial views of various locations, and for their stop in LA, we knew we had to illustrate a labyrinth of freeways. For the two nights of shows, we created a diptych with the maze of ramps and streets spanning both posters. The National posters are 18” x 24” four-color screen prints on 105 lb Stardream Silver cover stock, with a signed and numbered artist edition of 100 prints for each night. We also have a very limited number of uncut 36” x 24” poster sets. The National Los Angeles posters will go on sale at 10am PST on Monday, September 24 in the DKNG Store. We always enjoy being able to create a design series for a client, and one of our favorites is the recent run of tour posters for The National. The latest addition is for the band's European tour that wrapped up this week. In keeping with the theme of aerial travel scenes and the band's trip across the pond, this poster depicts a container ship docking at port with a few fun details included. The poster is an A2* (23.4" x 16.5") three color screen print on French Pop-Tone Whip Cream stock and has an artist edition of 100. Check out our initial sketch, closeup photos of the print, and a brand new process video below. The poster is now available in the DKNG store. *A2 (23.4" x 16.5") is a standard European print size. Please note that standard U.S. frame sizes may require a custom mat to accommodate. We're pleased to announce our most recent collaboration with one of our favorite band's, The National. They recently wrapped up their U.S. tour and after creating a few show-specific posters, we were excited to create our first tour poster for the band. In keeping with the theme of our work for the band, featuring various aerial scenes of Americana, the tour poster depicts a bird's eye view of an airport jetway. The poster is a three color screen print on French Speckletone Madero Beach. Check out a sketch of the poster below as well as a few closeup photos of the finished print. The poster is now available in the DKNG Store. And for National fans across the pond, we're currently working with the band on a poster for their European tour which kicks off later this month. Stay tuned for its release in late November. We're excited to announce our second concert poster for one of our favorite bands, The National. We got a lot of great feedback on last year's Tempe, AZ poster, and we were honored that the band asked us to create a poster for one of the shows on their current US tour. The poster is a 24" x 18" 4-color print screen print on 80 lb. French Speckle-Tone Sand. 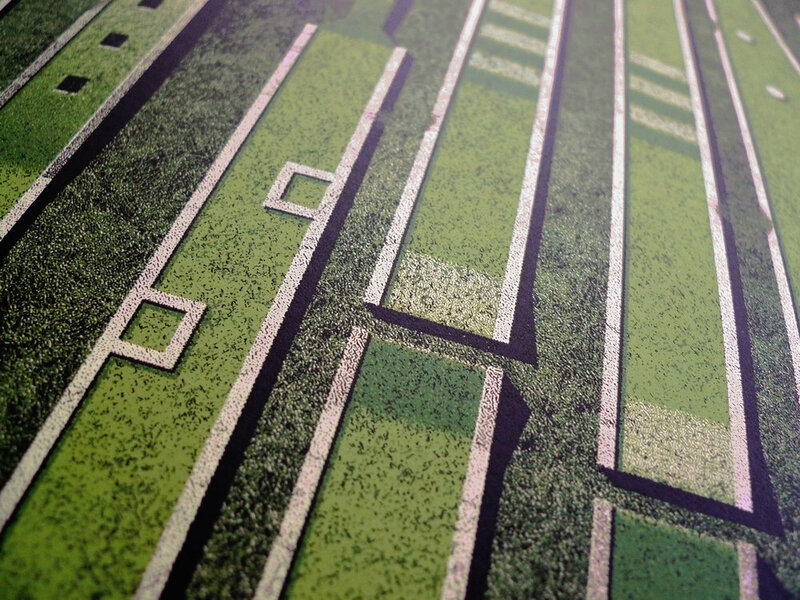 Last year's poster was an exploration for us in halftone printing and this year involved some experimentation as well, using dither patterns rather than halftone dots to achieve the textured look of the grass and concrete. 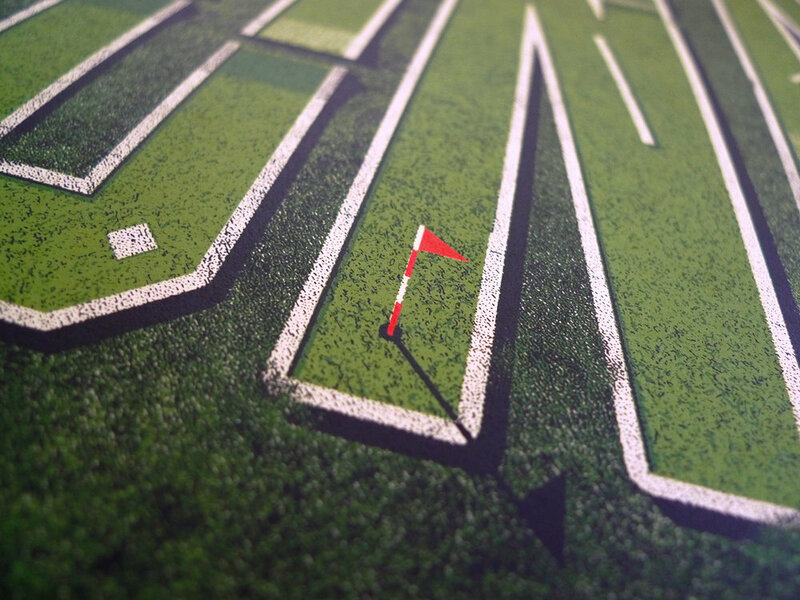 Check out some close-up shots of the poster below as well as our original sketch of the design. A limited number of prints are available in our store. Just in, the all new "The National" poster. The overprinting and half-toning in this poster proved to be a new challenge for us. That challenge would have been a regrettable burden if it wasn't for the expertise of our trusted local printer Danny Askar. The edition of 100 was hand screen printed with four colors. The poster will be available for purchase the day after the show on October 15. Keep your eyes peeled, I have a feeling this one will go quick. Below are some close up shots.